Some people find their home's electrical system a mystery. They're comfortable changing a light bulb or a fuse, but are in the dark about some of the other basics. Then there's the do-it-yourselfer who feels at ease tackling more complicated electrical jobs. Which ever category you're in, remember that safety comes first. It takes very little electric current to cause a fatal accident. What may look like a simple electrical job could end up being costly and unsafe if not done properly. As a licensed electrician with over 30 years experience in many areas of the industry, I'm often asked the following questions. Hopefully my answers will help take the mystery out of your home's electrical system. Q. I'm in the process of buying an older house with 60-amp electrical service. I've been advised that I may have trouble getting home insurance. Is 60-amp service dangerous? Q. What causes a tripped breaker or a blown fuse? Q. How can I tell which breaker has tripped or which fuse is blown? Q. Can do I the circuit mapping myself? Q. What if my breakers or fuses look okay but the power is still partly off? Q. After a breaker trips, how do I getting it working again? Q. My breaker keeps tripping and sometimes my lights go dim. What does this mean? Q. How do I replace a blown fuse? Q. When a fuse blows, can I replace it with a larger size fuse? Q. Do I need to have grounded wiring to each receptacle? Q. I'm planning some renovations to my home that will require electrical work. Do I need to have this work inspected? Q. What is knob and tube wiring? Q. Is knob and tube wiring dangerous? Q. How much does it cost to replace knob and tube wiring? Q. My house has aluminum wiring. Is it safe? Q. Can I install Decora plugs and switches on aluminum wiring? Q. I'm interested in having pot lights installed. What should I consider? Q. I'm restoring a Victorian home. Is it possible to restore the original light fixtures? Q. What can I do to improve the lighting in my kitchen? Q. When I change a light bulb can I use a higher wattage than called for on the fixture? Q. I feel uneasy about coming into a dark home and would like to know what products are available to automatically turn on lights so my house has a lived in look as. Q. I have cold spots in my home. What options do I have to solve this problem? Q. How do I look after the safety technology in my home, such as smoke detectors and carbon monoxide detectors, ground fault detectors and arc fault detectors? A. Some homeowners with 60-amp service have had difficulty either renewing their homeowner's insurance policy or getting a new policy. For the modern home, a 60-amp service may not have the capacity to handle today's lifestyle with the appliances and gadgets we use. The minimum service capacity for all new homes is 100 amps. Many homes are now built with 200-amp service to accommodate their needs. A. A breaker or a fuse is an electrical safety valve. If too much current passes through it, the flow of current will be stopped. It can happen when the circuit is overloaded or if there's a short circuit in the wiring for an appliance or in the wiring system. If you're constantly tripping breakers or blowing fuses, don't simply replace them. Call an electrician. A. Usually, a visual inspection will show that a breaker has moved into a mid position or the "tripped position"; with fuses, the centre of the glass may turn black. If your home has the electrical circuits mapped out, it's just a matter of locating that circuit on the panel and changing the fuse or resetting the breaker. This eliminates any guesswork. If power is not restored, contact an electrician. A. Yes. Electrical panels are supplied with small labels to indicate what each fuse or breaker is for, but these have very little room to make clear notes. One method involves making a floor plan sketch of each level of your home, showing every outlet, light and switch. At the panel, number each circuit breaker or fuse. Mapping is best done with two people and is easier if you can use two-way radios or cell phones. One person should be at the panel to remove each fuse or turn off the breaker, while the other checks which plug or light went off and indicates the corresponding number on the sketch. Another method is to list each breaker number on a letter size sheet of paper and indicate what it controls. This will give you plenty of room for details if needed. Stationery stores carry 8-1/2 X 11 plexiglass sign holders to hold your detailed list. Mount the list near your electrical panel. After your home is mapped, you'll have a precise picture of what each fuse or breaker controls. Large appliances like stoves, fridges, dryers, dishwashers, washing machines, dishwashers and furnaces should each have a their own fuse or breaker. If the power goes out, you only have to check the fuse or breaker associated with the appliance or part of the home without power. If this doesn't correct the problem, contact an electrician. A. There may be times when a breaker has tripped or a fuse is blown and it is not possible to tell by looking at it. Before calling for an electrician, test each breaker by moving the handle to the "off" position then "on" as if it were tripped. With fuses, replace each fuse with a known good fuse. If the problem is not corrected, contact an electrician. A. Like a fuse, a breaker 'trips' when it's overloaded. To reset the breaker, simply move it from the mid or tripped position to the off position. The breaker should not be switched to the on position for at least three minutes after being tripped. If it trips back off immediately, contact an electrician. A. Without inspecting the problem, it's hard to give you a definite answer. Symptoms of defective circuits are breakers tripping, fuses blowing, parts of the home without power, flickering lights, or dimming lights. This may not be an expensive repair as prices can start at around $120.00. A. Replacing a fuse is as simple as changing a light bulb as they both unscrew. A. No. This is a dangerous practice that can cause a fire. Homeowners often replace a blown fuse with a larger size fuse because the right size is not available or they believe the larger ones don't blow as often. The danger here is that fires can be caused by over fusing. As a general guide, fuses for lights and plugs should be rated at 15 amps. These are blue. The furnace, refrigerator and washing machine should also be 15 amps, but with a time delayed rating. The sure way to avoid this problem is to have old fuse panels replaced with a circuit breaker panel. A. Between the late fifties to mid-sixties, homes started to have grounded wiring to all electrical outlets. Grounding is required for appliances like washing machines, dishwashers, refrigerators, freezers and dryers. Homeowners often make the mistake of installing grounded receptacles such as the decora type in areas where there is no ground system. This is a dangerous practice and should only be done if modifications are made to the wiring. A. When any electrical work is done in your home, make sure it's done by a licensed electrical contractor and inspected by the Electrical Safety Authority (ESA). Your electrician should arrange this as part of the job and provide you with a copy of the Certificate of Inspection. 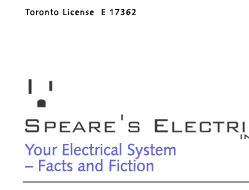 The ESA is a not-for-profit agency responsible for enforcing a level of public electrical safety across Ontario and certifies that work is done in accordance with the Ontario Electrical Code. The agency answers to the Ontario Ministry of Consumer and Business Services. For more information, visit Electrical Safety Authority at www.esasafe.com. Over the past few years, owners of older homes have been increasingly concerned about knob and tube wiring. Some homeowners have been unable to obtain insurance because their homes contain knob and tube wiring. Others have been told that they have 60 days to remove the knob and tube wiring or their insurance won't be renewed. Vendors and or sellers of old homes with knob and tube are also concerned. There has been a lot of misinformation about of knob and tube wiring. A. The first generation of electrical wiring, knob and tube wiring is a relic from the past. It was used in homes up to the 1940s. Also known as open wiring, the system consists of two wires to create a circuit. These two wires are held in place with ceramic knobs and tubes, compared to new wiring where the two wires are held in place by a plastic jacket. Knob and tube wiring is named after the porcelain knobs and tubes used to support the wiring. A. It's not inherently dangerous, but the type of insulation used has a tendency of drying out and falling off the wires, especially in areas for lights, switches and receptacles. When these homes were originally wired, life was pretty simple without much demand on the electrical system. Since then, the demands on our electrical system require additional outlets, circuits and grounded wiring. A. That depends on the size of your home, the amount the knob and tube and the approach taken. Basically there are two ways to replace knob and tube wiring. The first method is to waste no time trying to preserve walls or ceilings and run the wires in the fastest and shortest route. After the electrical wiring is installed and inspected, the damage needs to be repaired. The cost for this type of electrical work is lower if it's completed faster. Although you will save on electrical costs, you need to factor in the cost of repairing and repainting the walls and ceilings. Just remember there will also be a lot of inconvenience due to dust and dirt. The second method is much slower and cleaner and involves looking for ways to fish the wiring through the walls and ceilings. Because this process is so time-consuming you will pay more for the electrician's time. The up side is that you'll have little or no damage and only minor disruptions to your home. It's your call, but in any case be sure to have the ESA inspect the home and obtain a copy of the Inspection Certificate for future dealings with insurance companies or buyers of your home. A. Aluminum wiring was extensively used in homes about 30 years ago due to a copper shortage. It is no longer a popular wiring method and some problems have been reported from overheating and failure of aluminum wiring terminations. Some insurance companies are asking owners to have the connections checked. Symptoms may include receptacle discolouration or flickering lights. Have it checked out by a qualified electrician. A. Decora switches and plugs are rated only for copper wiring. They can be installed with aluminum wiring providing that proper changes are made at the termination. A. Pot lights can be used as general lighting or as accent lighting to highlight artwork or an object. The most common type of pot lights are the small halogen type, either GU10 or MR16 type. The installation costs are similar and on the surface these fixtures look the same. On the table below there are some differences that you may want to consider before ordering the fixtures. In most cases, pot lights are designed to be installed with minimal damage to your ceiling. Those installed in insulated areas, should have the I.C. rating (insulated ceiling) and a vapor barrier to limit condensation buildup. A. Speare's Electric works with craftsmen who specialize in the repair and restoration of antique light fixtures. Whether it's from the Victorian or Arts and Crafts era, you can buy restored original fixtures, as well as good quality reproductions. For ideas, visit www.rejuvenation.com. We also take great care in preserving stucco, plaster and wood paneling / trim if additional wiring is required. A. Kitchen work areas such as counters, sinks and islands require high levels of light, but are often overlooked. There are some very attractive and bright lighting solutions that can illuminate these areas and make them shadow free. A. No. Light fixtures are rated for the maximum wattage they can safely handle. If this is exceeded, the fixture can become overheated and cause damage to the socket and wiring. A. Timers can be installed in place of the switch to turn lights on at sunset and off at a specified time. In the morning, the lights can turn on at a specified time, then go off at sunrise. This timer automatically adjusts to the different times of sunrise and sunset so the homeowner does not have to make changes. These timers are also maintenance free since they don't need constant re-programming or battery replacement. Photo cells can be also be installed to automatically turn on outdoor lights at sunset and turn them off at sunrise. Another option is installing a motion sensor in place of the switch that can turn on the lights for a specified time when a person walks into the room. Another model can be installed with most outdoor light fixtures and will turn on the light when a person walks into the area being monitored. One of the hottest new areas of lighting design is outdoor lighting. In the past, the main concern was illumination for safety and security. Today, aesthetics are just as important. Landscape and outdoor lighting can enhance the beauty of your property and create some nice effects if done properly. Unfortunately, there are too many examples of poor lighting. Here are some tips to make sure your property is lit up to its potential. upwards or is bounced up from a reflective surface. fewer lights and less wattage, saving energy costs. illuminates the faces of visitors.  Use sensor controlled fixtures that turn on and off as needed. instead of a 100- watt bulb. property to cause a blinding glare. A. Most manufacturers recommend doing monthly tests on smoke detectors and carbon monoxide detectors and replacing them every 10 years. New models now have built in carbon monoxide detection and can be wired into your house circuit. They also have battery back up and can be connected to other detectors so if one alarm is activated then they all sound. Manufacturers also recommend monthly tests on any ground fault circuit interrupters (GFCI), arc fault circuit interrupters (AFCI).